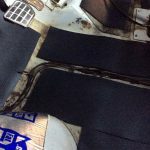 Update: 5/7/2018 – I also want to share that I also used/installed the FatMat floor liner (2nd Amazon product) in the front passenger area underneath the carpet. It also helps quite a bit with road noise. My 1993 Eurovan Weekender is a bit noisy while driving (ambient and road noise). There have been a variety of reasons for this including bad shocks, missing window molding, misc rattles inside, etc. So I’ve had a constant goal to make it more comfortable and quieter. 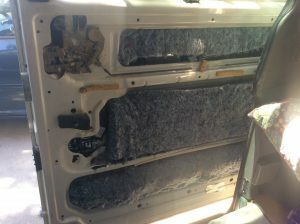 This past weekend I did more FatMat in the front passenger door and denim insulation in the sliding door and rear hatchback door. The removal of the panels from the doors is relatively easy, especially if you’ve done it before. 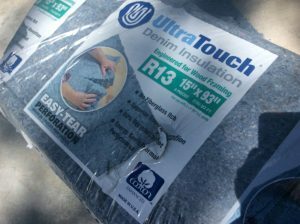 In addition to the sound dampening, I expect some better insulation for maintaining a comfortable temperature while camping/sleeping and even driving. 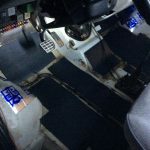 Next up, I intend to figure out how to remove the interior panels along the driver’s side near the table to the rear and other back panel as well. Thanks for the comment. I chose FatMat mainly because of the reputation. 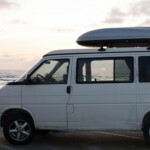 I’ve seen some other people recommend other products or even roofing tile, but I was a little concerned with the material/fumes… and since I love my van, a $100-200 is worth it for a project like this. 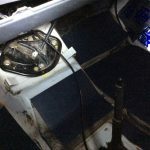 On another note, I don’t think I mention in this article about the floor liner I used in the front area. It is also FatMat and a bit thicker. I did that project at a later date (when I was cleaning my carpet). The floor line also makes a difference and is worth it. My wife and I both enjoy the new quiet cabin area when driving, and it even helps when camping (we go to music festivals). 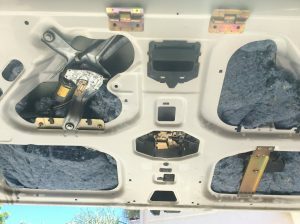 As far as the question about the door and denim… all areas of my van have denim and FatMat, except the front doors due to the windows rolling down. I didn’t want to cause any issues there so I only used FatMat on the two front doors. If the video shows a denim only area, it was only to illustrate the differences. 1 Pings/Trackbacks for "Sounds and thermal insulation"